I sure do love using the Windows 7 taskbar. (I might have blogged a few times about it already.) I have completely internalized the habit of right-clicking on a running app (or a pinned icon for a non-running one) to open a recent document - whether that app is Word, Notepad, PowerPoint, or whatever. I right-click any Messenger conversation to change my status, and I close instances right from the taskbar preview window. I wish Outlook would give me 5 or 6 jumplist items, like New Message and New Appointment, and I really wish Visual Studio would give me some options too. I am looking forward to new releases that will harness this intuitive way of getting users closer to the files they want to open or the things they want to do. In this article, we have explored some features of the Windows 7 taskbar, such as application IDs, thumbnail toolbars, overlay icons, progress bars and jump lists. The Windows 7 taskbar provides a clean, sleek launch surface that strongly benefits users. Integrating into this surface will be a primary goal for any application developer for Windows 7. Using the native Win32 APIs or the managed Windows API Code Pack provides you with a differentiating opportunity to light up your applications on Windows 7. Bear in mind that the taskbar is the first thing users see after logging on to Windows, and you'll want your application to be pinned to their taskbar. I completely agree. Give it a read. The Build a Better App site is all about applications. They've gathered tutorials, videos, and useful libraries for folks who are building client applications. You'll see some old friends of mine on the main page - Code Pack, Tim Huckaby's recent guidance paper, and so on - along with plenty of things I haven't linked to from this blog. But there's more, like profiles of some of the people whose work is on the site (love the fish, Tim) or videos showing the Windows Forms to WPF converter in action, Code Pack demos, and so on. Speaking of videos, Build a Better App has their own channel on YouTube, as well. Jono Wells is twittering on behalf of the site, and blogging too. 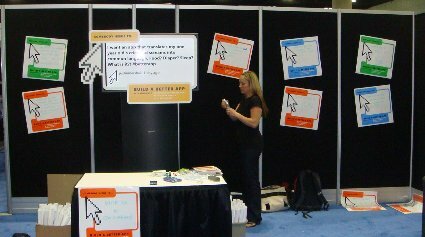 If you were at Tech Ed USA, you probably saw the Build a Better App team - they had a colourful presence and fun stickers and clings. There's a slideshow of some of the "better app requests" from attendees and while I doubt anyone will be coding a cloak of invisibility any time soon, there were some pretty cool requests in there. Take a look around, and if you want to submit some content for the site, let me know and I'll connect you to the right people. Of course, it's not a fist fight. Mike goes on to elaborate on the continuum of technologies and the way you can share skills between them. 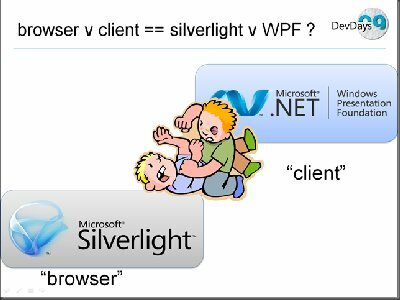 He also points to a post by Karl Shifflet that demonstrates how code can be reused between WPF and Silverlight applications. A process, once running, cannot elevate itself. You are launched elevated or not. A non elevated process can launch an elevated one. The easiest way is to make a separate exe and embed a manifest, then launch it with ShellExecute. An elevated process, once running, cannot "drop back down" to being elevated. As in the first bullet, you are launched elevated or not. There are some incredibly complicated ways to launch an elevated process but I don't use them because they are incredibly complicated. But you might have noticed there's a symmetry problem there. Can an elevated process launch a non elevated one? My first answer would be "it doesn't matter, because you shouldn't." My paradigm is that your core app should be non elevated, if at all possible, and if it has one or two admin-ish features, those should be refactored into a separate manifested exe that is launched (from a UI component decorated with the shield), does its stuff and gets out. However, a case can be made for having some sort of admin app that wants to leverage some other installed application, like Internet Explorer, that could possibly be using a malicious plugin or the like. This admin app would be smart to do its leveraging with a non elevated instance of that application. So how can you do it? Well, according to Aaron Margosis, it's a seven step process in native code. Managed code is left as an exercise for the reader. If you care, now you know how to do it. And even if you don't care, the symmetry is restored.